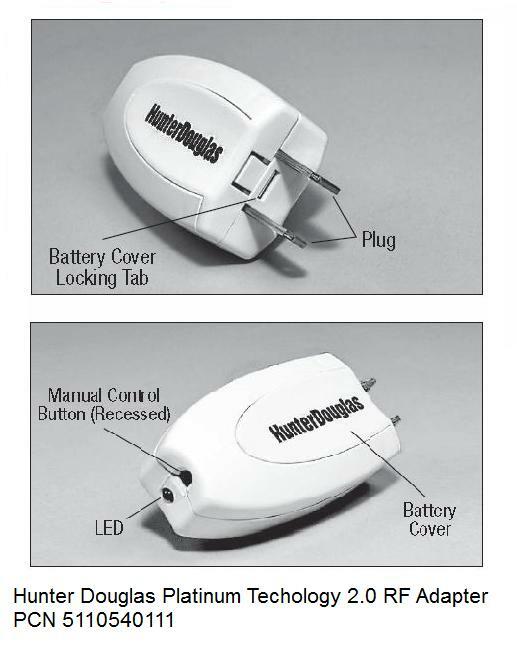 Detailed instructions for replacement or Repair Parts lists and schematics for Hunter Douglas PowerRise 1.0, Platinum App 2.0 and 2.1 Technology, Duette Honeycomb, Applause, Silhouette both Manual & Motorized Blind Systems and replacement lift motors online <Click Here> for on-line parts purchase. Platinum Technology(TM) utilizes both infrared (IR) and radio frequency (RF) methods of operation. 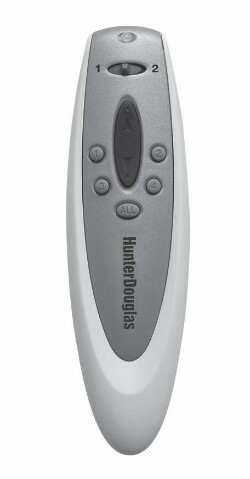 This new remote can control individual or groups of shadings and controls the entire Hunter Douglas motorized Platinum Technology (TM) line of products. Download the instructions guide for more information on setting up specific controls and groups for shades. The new Platinum Technology(TM) Wireless Wall Switch adds another level of control over Hunter Douglas Platinum Technology products. It works with all PowerRise(TM) and PowerTilt(TM) systems and the new PowerGlide(TM) 2.1 system for both Luminette Privacy Sheers AND Skyline Gliding Window Panels. 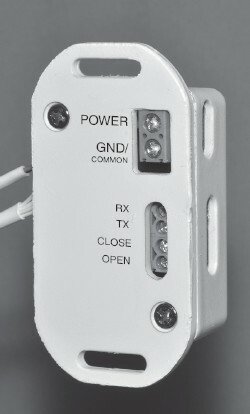 The wireless wall switch is powered by 2 AA batteries. The device sends radio frequency signals (RF) to Hunter Douglas Platinum-powered systems to make the window treatment raise, lower, tilt, or traverse. It has the same UP/DOWN directional button, four Radio Frequency (RF) Group Buttons (1, 2, 3, 4) and an "ALL" button that are used for RF operation. The RF Group numbers and the ALL button will light up, green of course, when a button is pressed. The wall switch has some additional features, too. With the wireless wall switch, multiple RF groups can be selected and operated at the same time. 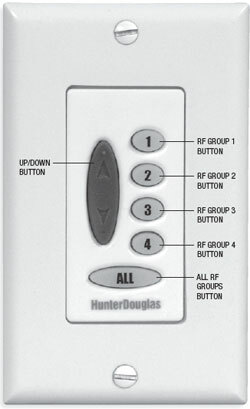 So if you select RF Group 1 and RF Group 3, the 1 and 3 buttons will light up. Then press the up or down button and both groups will operate at the same time. The Platinum Wireless Wall switch also has a built-in memory, so it will remember the last group or groups that were selected. So, if your last operation was to raise groups 1 and 3, you won't have to push the group buttons to lower them. Just push the down button and all the shades or blinds programmed for these groups will lower. The switch will remember only the last group selection. 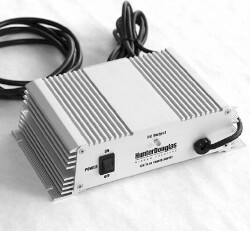 In August 2012, Hunter Douglas introduced the Platinum Bridge and Platinum Gateway interface modules to make this reliable battery operated system capable of being easily integrated with many popular Automation Systems. Both the Platinum Bridge and Platinum Gateway modules natively operate on the iPad/iPhone platform. The free "Platinum App" can be downloaded in the Apple App Store. As of this writing (August 2, 2014) the Android Platform has not yet been released. See area above to download the Platinum Bridge and Platinum Gateway brochures to learn more about these new advanced operating systems. 1) Can they be integrated? Yes! Purchasing a Platinum Gateway and Repeater Kit enables all Platinum Technology motorized products to be easily integrated into many home automation systems. Please call us for more information! 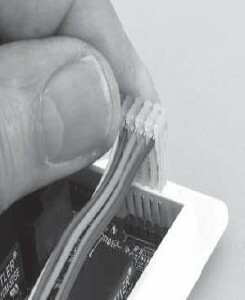 The Platinum Bridge Kit only allows iPad/iPhone operations and no integration. 4) Can they be controlled with RS232-RS485? Yes! Only the Platinum Gateway has this capability. 5) Can I Pre-Wire for them instead of using battery packs? Yes, using 16/2 CL2 rated wire for wire runs up to 150Ft. Some motors are 12V DC and some are 18V DC so you will need to purchase the correct transformer for the appropriate shade. 6) Can I retrofit the motor with another motor that is "Integration Friendly"? Yes...Somfy makes motors that can be retrofitted with most of the Hunter Douglas shade line and the motors can be integrated into most Home Automation Systems. The Hunter Douglas Platinum Technology 2.0 Hardwired Lift System can be integrated into many current Home Automation Systems with associated control components. This system requires wiring for both motor power and control. The system uses the ESI (Electronic Solutions) RQ (Remotely Queriable) control platform which usually requires an electrician and extensive RQ programming knowledge to implement. As of January 2012, all Companies selling this system must be trained and certified by Hunter Douglas. Most components listed below are available for the Hardwired System only and require 6-conductor modular wire for control and 14/3 with ground for powering the 110V AC motors or 16/2 CL2 in wall rated wire for low voltage motors. Home automation window coverings can operate with a remote control, a touch panel or even light sensors. In addition, operation can be programmed to raise and lower the window coverings at certain times of the day, on different days of the week. Home automation systems can easily accommodate motor-only window coverings and Hard-Wired systems from Hunter Douglas. Our products are very versatile in adapting to a variety of home automation control sources. Allows 3rd party integration of home control systems such as Crestron, AMX, Lutron, Lite Touch or PC computer systems to access and control Platinum Technology Hardwired blind installations via RS-232 communication. 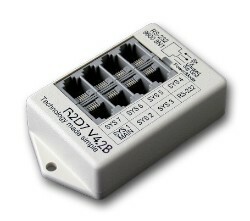 Up to 7 Platiunum wall switches can be controlled using a single R2D7 RS232 serial bridge. 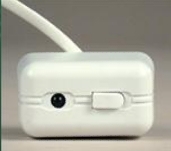 The Hunter Douglas Dry-Contact Harness Kit (PCN 2170000229) is a connector with five attached wires that is designed to communicate dry-contact closure information between the Hunter Douglas Platinum wall switch (PCN 2951710000 not included) and other devices. The Platinum wall switch has both dry contact inputs and outputs that can be used with advanced control systems, as well as mechanical switches or relays. Control systems. One connection interface is needed for each motor. PowerGlide 2.0 Hard-Wire was available in May 2009. This motorization enhancement allows the Luminette PowerGlide 2.0 motor to be controlled from a platinum wall switch. 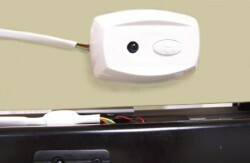 The motor can also be wired into any home automation system. Luminette PowerGlide 2.0 is now home automation ready. 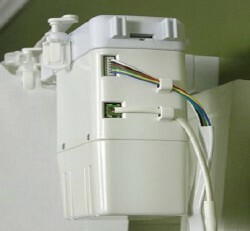 The connection interface component provides an easy way to connect the wall switch, a home automation system, or the Platinum satellite eye. Now consumers can choose to control their PowerGlide 2.0 sheers using a Platinum remote; the new Platinum wireless wall switch, which is essentially an RF remote in the wall; the hard-wired wall switch; or their home automation system. As you can see, PowerGlide 2.0 is now a very versatile operating system. NOTE: This interface will only work with the new PowerRise, PowerTilt and Power Glide 2.0 Motors and is NOT backward compatible. Platinum technology can be used to retrofit any PowerRise (TM) or PowerGlide (TM) lifting system made on or AFTER May 1, 2003. This includes Duette, Silhouette, Vignette, Brilliance PowerRise Systems and Luminette PowerGlide Tilt & Traverse systems. 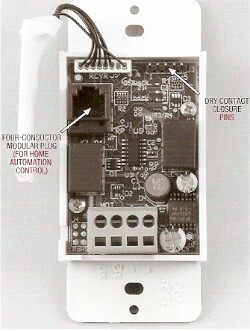 To retrofit an existing system, a new Platinum Technolgy remote, shown above, and the NEW IR/RF Satellite Eye, shown at right are added to the system. 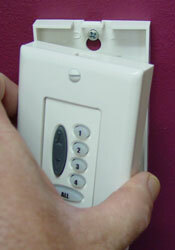 The new remote may be used to operate ALL existing PowerRise and PowerGlide window coverings. One new satellite eye per blind will be needed. This sort of retrofit is not available for horizontal blinds with the PowerTilt system. To find out when your system was made: Remove the blind from the window. Look in or on the headrail for a white, pink or blue production sticker. Find the production date on the sticker. The Platinum RF Adapter uses current sensing technology to operate PowerRise 2.0 and PowerGlide 2.0 products. The adapter plugs into a standard 110VAC duplex wall outlet and detects AC power. The device will send out a signal to open or close the window covering based on whether or not power is present in the outlet. The RF adapter can be used in conjunction with a off-the-shelf lamp timer or switched outlet for simple operation. For Automation control, install a Z-Wave or X-10 compatable outlet to switch the outlet ON or OFF. Switching the outlet ON raises the shades, switching the outlet OFF lowers the shades. Plug in supply to power Platinum Technology Hardwired installations. NOTE: all trademarked items are the valuable property of their respective owners.